Ice cream, candy, and cake are life’s little pleasures. Who doesn’t love a sweet treat now and then? 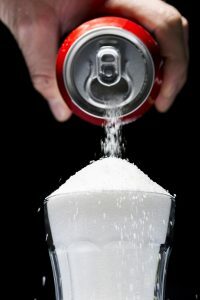 But sugar plays a role in the formation of dental plaque, and if you aren’t careful, those and other sweet foods and drinks can damage your teeth and gums. Your mouth is host to many types of bacteria, some are beneficial to your health and some are harmful. One type of destructive bacteria is streptococcus mutans. This bacteria feeds on the sugar you eat and forms dental plaque. The colorless, sticky plaque adheres to your teeth which makes it harder for saliva to wash it away. If plaque is not washed away by saliva or brushing, it turns to acid which starts to dissolve the enamel of your teeth. Once the enamel begins to dissolve, holes can start to develop. These holes are cavities, otherwise known as tooth decay. If left untreated, decay will progress from the enamel to the deeper layers of the tooth, eventually reaching the pulp of the tooth. Your tooth may become painfully infected, and may result in the loss of the tooth. Fluoride is a mineral that is found naturally in all water sources and is known as “nature’s cavity fighter.” When used properly, fluoride is a safe and effective way to prevent and even reverse early signs of tooth decay. It is added to community water systems, and of course, most toothpastes. Dentists also give professional fluoride treatments. According to the American Dental Association, fluoride use has dramatically reduced incidences of tooth decay. The most effective way to remove plaque from your teeth is by brushing. Use a fluoride toothpaste and brush for at least two minutes, twice a day. Brush back and forth, and the front, back and top of teeth. Don’t forget to brush your tongue too. The same bacteria on your teeth is also on your tongue. Brushing your tongue will remove the bacteria before it starts to smell and cause bad breath. Plague doesn’t just attack the visible surfaces of your teeth, it also accumulates between the teeth. Flossing breaks up the plaque and removes it before it can cause cavities and gum disease. Water not only keeps you hydrated, it is also good for your dental health. Most tap water contains fluoride, plus drinking water after consuming sugary or acidic foods is a great way to help dilute and rinse away cavity-producing bacteria in between brushings. Water also prevents dry mouth, which is caused by lack of saliva. Saliva contains several important elements that provide natural defense against plaque acids so you always want to make sure that you are producing enough of it. Dental health and diet go hand-in-hand. Sugary foods cause the bacteria in your mouth to go on a feeding frenzy which creates decay-producing acid. Some foods and drinks like soda, fruit juice, sports drinks, and even fish are already acidic; they will start damaging tooth enamel almost immediately. Try to limit sugary or acidic foods and drinks to special occasions and don’t consume anything with sugar after your evening tooth brushing. Fermentable carbohydrates like saltine crackers, bread, and cereals also contribute to cavities because they break down into simple sugars in the mouth. Again, this sugar will trigger bacteria growth that leads to acid and tooth decay. If you must drink sugary or acidic drinks, use a straw to minimize the amount of liquid that touches the surface of your teeth. Milk, cheese and yogurt are rich with calcium and protein which can help strengthen your teeth. Cheese can also increase saliva production. According to the American Dental Association, clinical studies show that chewing sugarless gum for 20 minutes after meals can help prevent tooth decay. Gum chewing increases the production and flow of saliva, which can neutralize acids caused by bacteria, and can help wash away food. There is no substitute for having a professional evaluate the health of your teeth and gums. Visit your dentist every six months for a routine cleaning and examination. The dentist will look for signs of tooth decay and other dental problems. You will be able to treat any issues early and take measures to protect your oral health. Your teeth are meant to last a lifetime. Use these tips to help preserve your dental health. Nothing is a sweet as a great smile!